The restored site Binnerfeld in the river Ruhr is located in the Federal State of Northrhine-Westfalia in the urban area of the city Arnsberg. The Ruhr in Arnsberg belongs to the NATURA 2000 area, serves as an important place for local recreation and is highly frequented by cyclists, walkers and canoeists. Prior to restoration the river was flowing monotonously in a constrained and narrow planform fixed at the banks by riprap. The main aims of the restoration measures were to restore more natural hydromorphological conditions and to re-establish longitudinal connectivity resulting in a higher morphological and biologcial diversity. Moreover, it aimed to increasethe aesthetic value of the river section and to raise people’s awareness of the importance of biodiversity by making nature tangible. 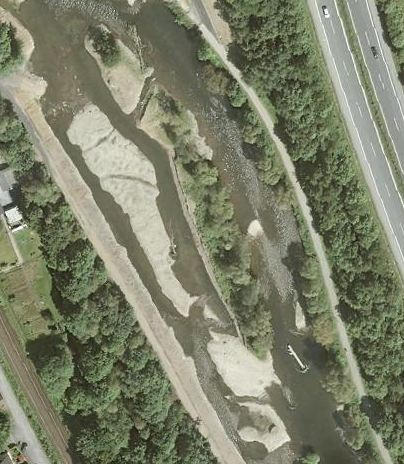 Restoration measures were implemented step-by-step from 2006 to 2011 on a total river length of 4.5 km.